From the amount of activity on this blog, you'd think that I had nothing going on...but that would be *very* wrong. I had a great time in Ballston a few weeks ago. We were so busy getting caught up with crafter friends, looking at your neighbor Sweet and Light's great, fun designs and setting up all of Stacy's photos that the day flew by! Two weekends ago, I was in NY for the Clearwater Revival. Rain, fog, showers and WIND! But, also, I had my mom as an assistant, which was a luxury in itself and she brought me hot cocoa that was soooo good! And, brownies too. Yum! This weekend coming up, I'll be in Annapolis for the First Sunday Festival, for the first time since last year. I will be set up in Whitmore Park, which is on Calvert Street, at the end of West Street away from the circle. Come see my NEW tote bags!! Just like buying from large companies that are doing good in the world makes us feel good, buying from smaller companies that are doing great makes us feel great. For the love of... is one such company for me. First, the creator and crafter, Kristina is doll. Genuinely nice and thoughtful, intelligent and insightful, she is saving the world in her own way. Recently I expressed some stress and anxiety (and who doesn't have these?) and she immediately gave me some bath soak. It just goes to show what kind of business person she is, one who actually cares. And, while this did not solve my pressing problems, it did allow me to s l o w down for a moment in time and think, relax and inhale. I loved it! 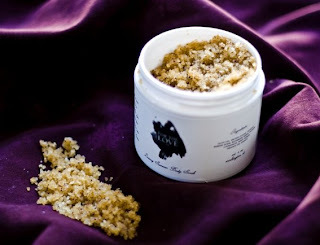 I also love that her products are made from organic materials in small batches in DC. Tired of a world where emotion is held back and femininity has been demeaned, For the Love of… founder Kristina Libby strives to embrace the joys of feeling beautiful. At age 25, Libby left her job in corporate America to pursue her dream of providing a product that would touch other women’s lives, even in a small way. Calling upon past experiences as both a florist and model, Libby designed the For the Love of… line with the idea that while beauty may come in all shapes and sizes, every woman should have a signature secret that makes them feel beautiful. Nourishing the soul is as important as feeding the mind, and For the Love of … products provide an affordable escape for women of all ages. Libby uses products from her home state of Maine and from her travels around the world. 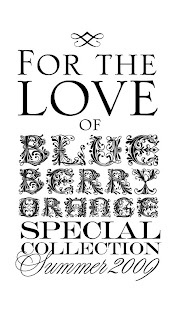 Blueberry seeds are inspired by her youth, the orange peel by a trip to Spain, the fragrances by a few soul-searching trips in Costa Rica, and the tuberose and sandalwood from a last-minute flight to Cartagena, Colombia. Her hope is to eventually import products from communities around the world and use the funds from the sale of those products to create clean bathing water funds and micro-credit loans for that community. In keeping with the For the Love of… product mission, five percent of proceeds from all product sales are donated directly to women’s causes on a monthly basis. For this month’s nonprofit group, visit the Affiliations page. So go ahead: laugh, love, beautify, nourish. You deserve it. A~I was riding the train back from NYC with my then boyfriend mulling over my future. I was about to leave my job and was still wildly unsure of what I wanted to do with my life. All of a sudden, I hit it on the idea. "Jason," I said "I'm going to start a business. I think I'll make soaps." "Uhh.. okay...," he responded, the disbelief and sarcasm echoing in his comment. I smiled, the antagonism pushed me on and voila "For the Love of..." was born. A~I continue because I realized that I love the creative challenge that having a brand and a product line brings. I love the wealth of opportunities that this brings me and the many many new people I get to meet! A~From adventures. I want to be Peter Pan, Captain Jack Sparrow, the Narnia children, and Pocahontas all rolled into one. I want to have adventures that you write home about, that you tell people in long-winded fireside chats. I want to save something and destroy something and feel impassioned and empowered. I want to love, to laugh and to find the bad things to be worth living so that the good is so much better. I want to see the bad and know that its only a passing fancy. I want to have pretend sword fights in the woods and real sword fights with intellect pitted against greater intellect. I want to have a body that can withstand a hurricane and a spirit that can survive the greatest despair and the highest flight of fancy. I want to walk in the woods with LL Bean boots and stroll down Manhattan in Manolos. I want a life that's worthy of covetousness and that is filled with love and happiness and joy. For the most part, I get to live this ridiculous adventure that just happens to be my life and this provides a wealth of inspiration. A~I create because to not create means I am accepting of the status quo. Creation means that I'm creating something new, something better than before and something my own. I love that. I love being able to start with nothing and end with something. I love to be a force that creates a change. Q~What is your dream about our art? 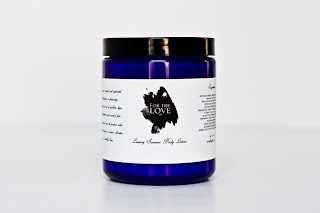 A~For the Love of... is an organic bath and body company that works with a triple bottom line mission-- we want to make a profit while giving back to the community. A~On an island in Maine in the summer, on a deserted tropical island in the winter. A~Fame, fortune, and fun--- if I'm super lucky and work incredibly hard. Fingers crossed. Fingers crossed! A~Can you tell me a funny story? You can buy these products in the DC area at Greater Goods, 1626 U ST NW and online at www.fortheloveofbathing.com and www.fortheloveofproducts.etsy.com.